The transit of Venus on June 5th this year sparked much attention worldwide. Astronomers and the general public alike gathered around telescopes or grabbed their solar filter glasses to observe this rare alignment of the Sun, Venus and Earth. 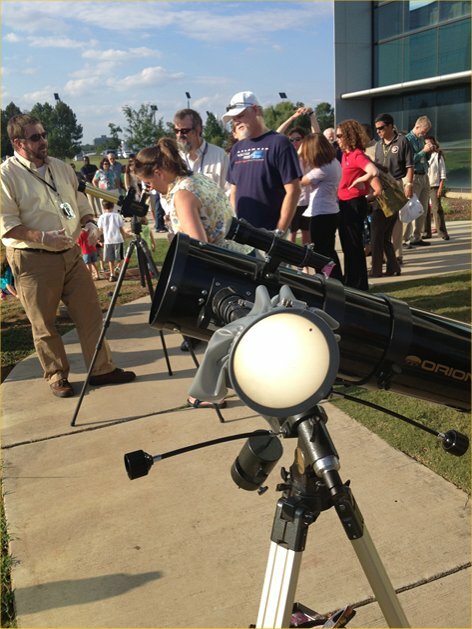 Members of the Natural Environments Branch brought together their telescopes to have a viewing party at Marshall Space Flight Center; fortunately, the weather cooperated, allowing for some great views of sunspots and Venus. Crowds gathered at Marshall Space Flight Center to catch a glimpse of Venus transiting the Sun. Jody Minor stands in the background with his solar telescope showing viewers features on the Sun’s surface, while the telescope is in the foreground has Sun and Venus projected on a screen (image credit: Rhiannon Blaauw). Venus transits have been studied for centuries, with important scientific information being extracted from them. There is evidence of observations in Assyrian archeology from 1500 BC, but it was not until 1639 AD when a transit was correctly predicted and observed. Jeremiah Harrocks of England used this transit to estimate the distance between Earth and the Sun, coming up with 59.4 million miles, which may sound like a far cry from the actual 93 million miles; however, it was the most accurate figure at the time. Each predicted and observed transit since then (1761, 1769, 1874, 1882, 2004) provided more new fascinating finformation about Venus, such as discovering it has an atmosphere (the bending of light rays around Venus in the 1761 transit). With the next Venus transit set to occur in 2117, one can only imagine what technology will be developed by then and what our transit images will look like. 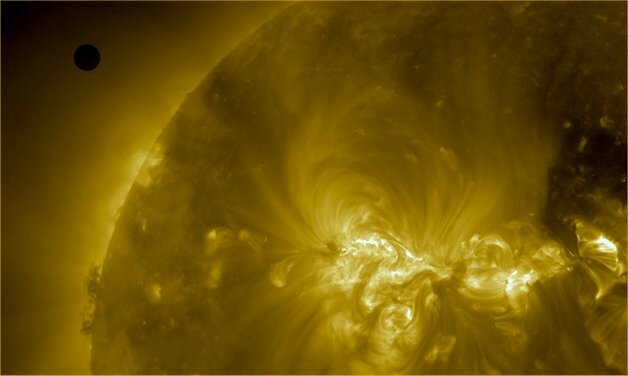 This image, by NASA’s Solar Dynamics Observatory, shows Venus on June 5th 2012 approaching the disk of the Sun (image credit: NASA/SDO, AIA).